Aah, the internet. Don’t you love how one minute you can be deep in serious research for an article you’re meant to be writing and the next your blood pressure is sky-high as you frantically search eBay for boots which you never even knew existed until you stumbled on them by following (completely unrelated) links. Yes, thanks to the internet I’m now obsessed with these valenki boots which I had never heard of until yesterday when I was researching something for the next issue of Peppermint. 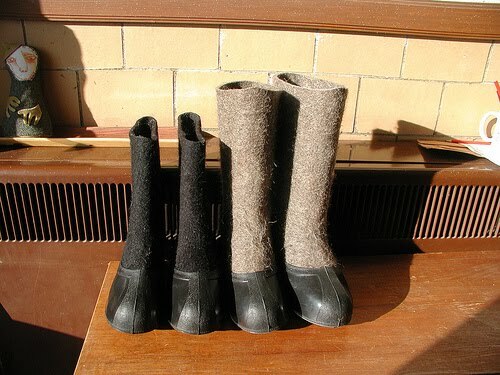 They’re made of felt and as far as I can tell, you can wear them around the house without the rubber galoshes part, like a Russian version of Ugg boots, or slip on the rubber covering for when you have to go out. Crafty people like to decorate them too, which is sometimes good, sometimes .. not so good. I think I’ll stick with the fairly plain ones, although even that decision’s tough, and there’s only black or brown to choose from. I love the way the brown pair look sort of like little goat legs, but it’s not every day you want to look like a goat, eve n a really cute goat. So maybe the black? And as if to illustrate my point about the internet feeding my ADD and taking up my time, I’ve just spent 10 minutes looking for goat pictures and am now dreaming of creating a whole outfit inspired by these cute kids. They look like little supermodels with their perky tails and high heels! !